Interesting that Hunt would choose the Benton types, as opposed to any of the array of sans serif possibilities available today. News Gothic, used for the opening crawls of the Star Wars movies, was found to be the most legible typeface in a 1912 type legibility study done by Barbara Roethlein at Clark University. 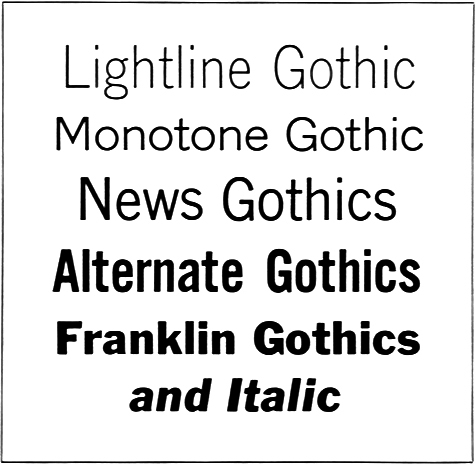 “If legibility is to be our sole criterion of excellence of typeface,” Roethlein wrote, “News Gothic must be regarded as our nearest approximation to an ideal face, in so far as the present investigation is able to decide this question” (see page 234 in my book). Morris Benton was 36 years old when News Gothic came out in 1908, and had two young daughters, aged ten and six and no doubt learning to read. He hadn’t yet formally initiated the legibility studies he would pursue for designing Century Schoolbook (1918–1921), but he must have studied or at least discussed Louis Emile Javal’s 1879 type legibility test results with his father, who used them to collaborate with Theodore Lowe De Vinne on the Century Roman type, designed for De Vinne’s magazine The Century, and first used in 1896. In a letter dated July 9, 1909 and published in the July 16, 1909 issue of The Dial (an American magazine of literature, philosophy, and politics, that was published during the 19th and 20th centuries), Bruce Rogers agreed with and repeated a sentiment that another letter-writer to The Dial had put forth, namely, that the most beautiful types are also the easiest to read. Apparently, Adobe’s Paul Hunt agreed.